Today was a snow day but really it was icy and super cold. Since T. had his appendectomy a little less than a week ago we've been cooped up in the house. So today I started cleaning...really cleaning. We took this room apart down to the floor. Dusted and vacuumed every piece. I'm calling it Spring Cleaning! Honestly, I'm a little obsessive about cleaning daily. However, the proof of life was there in the Dyson tank when I finished. I'm going to change up the pillows so I'm searching for something fresh to add in here. My goal is springy and a little less busy. I kind of like these in ivory with the jute trim. Do you know what makes Spring Cleaning fun? The pie is cooling now and we can't wait to eat it! See this little leopard chair? The tag called it Aunt Ruth's Chair when we bought it a year and a half ago. Well, this chair is the devil to sit in. Cute as can be but so uncomfortable!! I think Aunt Ruth's Chair will get moved to an area with less traffic. This was a productive and enjoyable way to spend an icy day. If you have ideas for this room please share. It looks very busy to me. I've been in a no cleaning funk. As in there is dust everywhere. There was a time when that would have driven me crazy. I applaud your cleaning and most especially your baking. I LOVE chocolate pie and haven't had it in years. Love to clean like that! Love the pillow too! I'm not sure that I have ever seen this room before!! 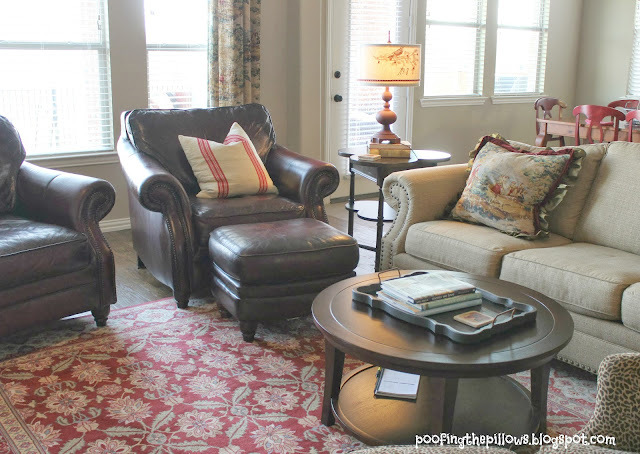 I just loooove that lampshade and what a gorgeous rug and sofa. Hmmm might have to jump on Polyvore and have some fun :) Love the PB pillows, but have you seen them at hobby lobby? They are folded up in packages over by the beads and tassel fringes, they are smaller but seriously the same.darn.thing. $10 full price and they come in several colors. Anyway I love this room! I think some fresh pillows could be a really fun addition! I think your room looks terrific! I love the touches of red and the new pillows work well. Makes me smile! I've been changing things up a bit, too. I still need to figure out 2 different shams for the 2 extra pillows on my bed. Sweet hugs! I have been taking each room and spring cleaning myself. Your room looks so nice and relaxing. I think the room looks pretty as is, love that lampshade! Maybe a little spring cleaning will make spring appear? If so, I better get to it! Ok....Love the lampshade, Aunt Ruth's chair (even though uncomfortable) pillows, curtains and everything. I think you are a long lost sister of mine. p.s. if you want to share that recipe on my Tasty Tuesday linky party, I would love it! Cleaning is easier in bad weather. When it is sunny, I love to play. I got a lot of cleaning done in our 5 days of rain. Cleaning a room just makes everything better!! My mother used to tease me that I love CLEAN so much I would be happy to dab a little Pine Sol behind each ear! We had a snow day today, too. I kind of like days like this but I didn't get any cleaning done. :) I need to take a day and do the deep cleaning as well. Always makes me feel like I've accomplished something when I can. This is such a pretty room, Stacy. I am in love with your area rug! I'm still working on closets and cabinets, I'm barely keeping my head above water with cleaning! It sure does look comfy! I always love moving things around. 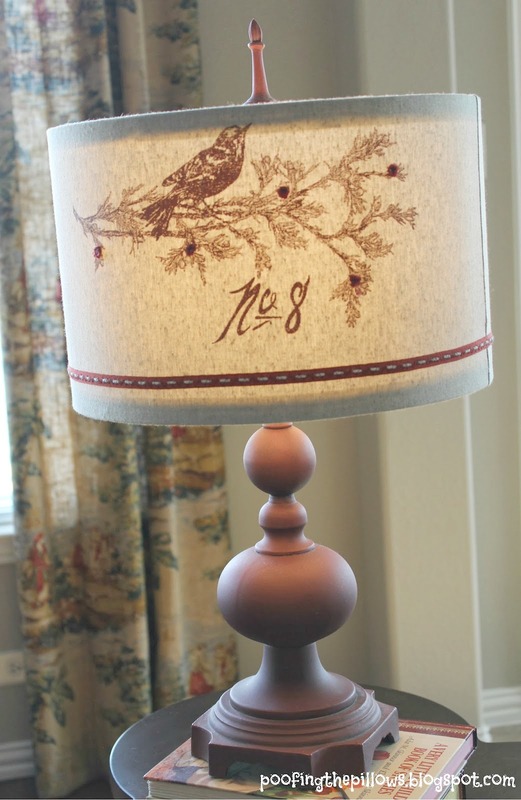 I love that lampshade with the bird, Stacey! I need to get going on Spring cleaning ~ before it gets too nice and I want to be outside instead of in! : ) I think moving that chair to another room is a good idea. Maybe a guest room? I think if you then move one of the other chairs into its spot it won't feel like too much to you. I love the toile pillows on your couch!! I hope you keep them! The grain sack pillows on the leather look great too!! I would have suggested the solid pillow you gave a link for-for the leopard chair, but you mentioned that that chair was leaving the room. I think the room look beautiful, but if it is feeling to busy for you, I would bring in a neutral rug (such as sea grass) or neutral curtains (maybe linen). The room may look busy to you, but it looks inviting to me. I like to clean like you too, although my cleaning has never included a chocolate pie. That made me smile. A reward at the end...right? Hi Stacey! Oh, your room looks gorgeous and I don't remember you showing it to us before. The lampshade is so sweet. Too bad about the leopard print chair - she is a cutie. Deep cleaning like this feels so good and your room is sparkling! I'm all geared up for a little spring cleaning myself! Just love your home, Stacey! Your room is lovely and oh so clean! Love all your furnishings and those slashes of red just make it for me. I love how your kitchen island opens into your family room. Beautiful! Your house looks so nice and tidy! I think those pillow covers you're looking at would be perfect! If it's looking too busy for you, maybe a solid rug would "ground" everything? Then again, I have boys, so I can't imagine having a solid color rug because I need patterns to hide all the stains. :) I really like the table behind the leopard chair. Those legs are gorgeous! I like the lamps you have on it too. I would gladly take one tenth of your energy. How about a solid comfy chair in place of Ruth's? Such a pretty room and I am getting ready to spring clean too. You are always working on your home!! I love it. Now see, I think the room looks cozy, warm and comfy, though I do like the pillows in your link. 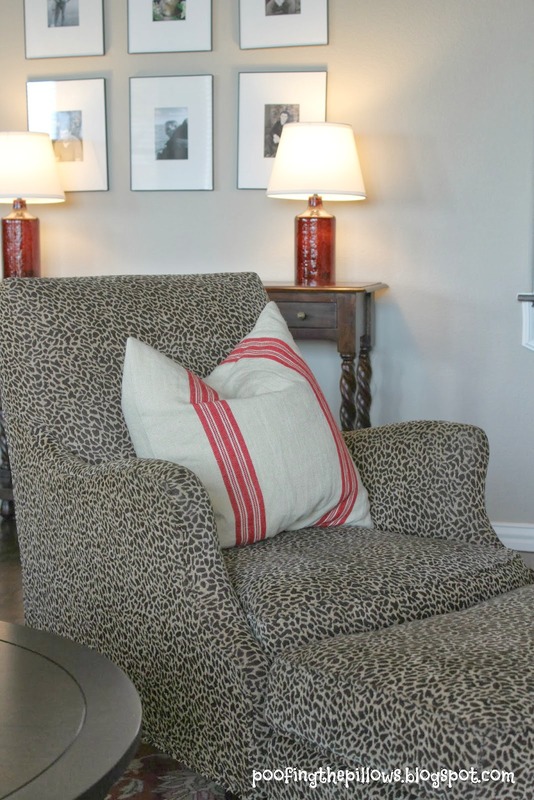 The leopard chair does look a bit uncomfortable..not the kind to sink into like your couch and leather chairs. So I could see trying to find something else for that spot if you needed another comfy chair there. 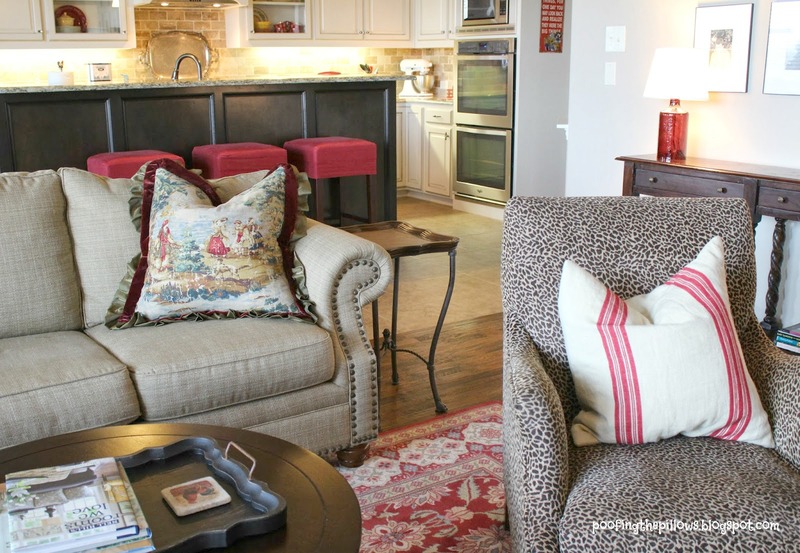 I think your family room looks very pretty! I love all the pops of red in it and how open it is to the kitchen. Love that lamp you showed too! I bet you feel great knowing that you cleaned your house so well. That's a good feeling. Isn't that strange the way something looks comfortable but it isn't? I wish I was in the mood to spring clean. That is not an annual event at my house. Never seems enough time to do that kind of deep cleaning, but it sure feels good when you do. I love the lampshade and the chair, to bad you have to move her! Chocolate pie, I love, my mom always made it.